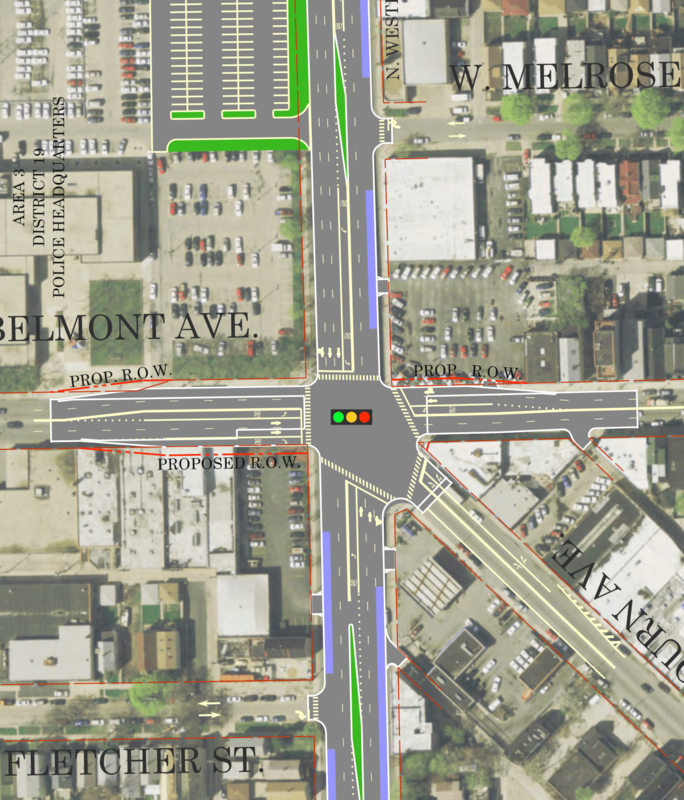 A CDOT rendering from the June meeting shows a plan to expand Belmont to six lanes for over 500 feet, across the intersection of Western Avenue and Clybourn Avenue. Bicycling up and over the Chicago River on Belmont, from Avondale to Roscoe Village, will soon be more comfortable once the Chicago Department of Transportation gives the street a “road diet” and replaces car travel lanes with new buffered bike lanes. Bicyclists shouldn’t get too comfortable, though: Once they’ve crested the bridge eastbound, they’ll be dropped into the middle of a six-lane highway. Yes, CDOT is narrowing Belmont from four lanes to two on one block, and then on the very next block widening Belmont to six lanes, while eliminating the bike lanes completely. The road diet is planned between Western Avenue (2400 West) and Washtenaw Avenue (2700 West). Its buffered bike lanes will extend west to Kedzie Avenue and, eventually, east to Halsted Street in Lakeview. Not only will the road diet give bicyclists a rare chance to safely climb over the Chicago River, but it will bring Belmont into a consistent lane configuration — it’s two lanes wide both east of Western and west of Washtenaw. Two lanes is perfectly appropriate for Belmont’s light traffic: 14,000 cars per day were counted in 2010, which two lanes easily handle on similar streets like Milwaukee Avenue and Halsted. Yet, at the exact same time, CDOT is continuing to advance another plan for Belmont that’s at odds with the goal of making it a comfortable street for bicycling and walking. As Belmont approaches Western, where a crumbling overpass is being removed, the street will balloon from two to six lanes wide. The planned intersection [PDF] will require condemning private property, demolishing the fronts of several buildings at the southwest corner, and halt the bike lanes hundreds of feet short of the intersection. This widening project is eerily reminiscent of how Harrison Street was widened at Congress Parkway, an unsafe and unnecessary move that was finally undone last year. The situation didn’t improve traffic flow much, since it simply created bottlenecks on either side where several lanes had to merge into one. The widening is also at odds with CDOT’s current practice of striping bike lanes through intersections, and puts bicyclists at greatest risk right where they most need protection. CDOT plans to demolish at least part of the buildings at right so that it can widen Belmont Avenue. Photo: Steven Vance. Belmont is designated as a key Crosstown Bike Route in the city’s Streets for Cycling Plan 2020, and would be a great way for bicyclists to get between the north and northwest sides if only there weren’t a huge, crowded, high-speed intersection dropped right into the middle of it. Michelle Stenzel was a co-leader for the plan’s North Side district, co-chairs Bike Walk Lincoln Park, and is disappointed with CDOT’s plans for Belmont at Western. After these concerns were brought up to Aldermen Deb Mell and Scott Waguespack, CDOT project manager Charlene Walsh said the project respects the city’s complete streets policy and considers vulnerable road users, children and seniors. Walsh said that “[complete streets] concepts are being implemented in the project where feasible” — even though, as Stenzel points out, the city’s definition of “feasible” doesn’t include bike safety. She added that the Safe Routes to School Program at nearby Lane Tech High School would continue, and CDOT would build pedestrian islands at nearby intersections. However, bike facilities were explicitly excluded from this project, since “Western is the dominant street when considering design requirements, and the narrowing (reduction) of Belmont [travel lanes] cannot occur,” Walsh said. In other words, since Belmont has four lanes today, it must always continue with at least four through lanes, plus new turn lanes to let cars roll through even faster. This part will get the bike lanes, but not through the intersection where they’re needed most. Updated to remove a statement saying there would be a bulbout on Clybourn. Some engineer plugged this intersection into modeling software, and found that the light timing at Belmont has to be kept as short as possible to keep Western free-flowing. Thus 6 lanes of queuing. Now, instead of a highway capacity calculation, let’s look at reality. There an intersection with slightly more volume on all approaches, slightly more pedestrian conflicts, and probably more turning volumes that operates at present with effectively 4 lanes on the cross-street (1 through, 1 left, 1 right, 1 opposing). This is Western/Diversey/Elston. What’s more, this intersection already sets the capacity on this section of Western independently of the intersection at Belmont. There’s no need to max out the capacity at Belmont. Finally, with 1/2 mile between the intersections, it should be possible to provide some level of signal timing coordination between the intersections to keep vehicle delays to a minimum. When will we switch to safety for all road users being the primary goal, and moving vast amounts of traffic only “when feasible”. Bummer. I always ride my bike on the sidewalk through this area. Looks like that is not going to change. It’s becoming increasingly clear that CDOT wants comfortable bike infrastructure to be much like the El: great for professionals commuting downtown, but jack for cross neighborhood trips. I guess that’s the inevitable outcome of placing so much emphasis on commuting versus other types of bike trips. Which, admittedly, is far better than most US cities are doing. But I expect more out of this city than “better than most US cities”. And Western itself will be 6 lanes during rush hours at that intersection. I didn’t understand why they didn’t grab some of that space for BRT or bikes (and I expressed that opinion at the open house). But then, to think about this crazy thing on top it is just making that intersection out to be really strange and dangerous. How is it not feasible to have bike lanes when you have six lanes for cars? People will bike there–they have to. There aren’t other good through streets, and this will just make it unsafe. Also, I don’t know that Safe Route to School improvements at Lane they are talking about. They painted “school zone” on the street, but did nothing else to improve pedestrian or bike (or even car–dozens of parents drop kids off in an unsafe manner) traffic in that area under that program from what I can tell. Hundreds of kids bike to Lane daily. Good luck to them figuring out how to get there safely. There’s only kinda 4 through lanes on the west side of the intersection. 2 for westbound, but east bound is 1 left turn, 1 through, 1 right turn that is through for buses only. They’re adding a through lane to eastbound. East side is more or less what they have now, they’re just widening it unnecessarily. Exactly. Since this project started, I’ve thought they should just cut Clybourn off and make it a “normal” 4-way intersection. There’s never much traffic north of Diversey, so just cut it off a block back and route the through traffic onto Diversey, which is itself overly wide between Clybourn/Damen and the river. Woah hold up – Does the CDOT design recommend eliminating the Clybourn bike lane northbound? I’m going to give them their consultants the benefit of the doubt and say that not drawing the bike lane in there was not an oversight but left out to create a simplified drawing. However, that, in the end, just makes for shoddy work and an inaccurate representation and acknowledgement of reality. It’s not the worst part of this project. They’re also excluding bike lanes from it. Hey, maybe they should acquire more property and widen it a bit more to insert those bike lanes! This project is going against everything CDOT has said they stand for, coming up on four years now. Which I think can be boiled down to “there’s too much space given over to automobiles and not enough to any other mode”. The westbound lanes on the west side of the intersection are in a different state. I believe there are two marked lanes, but with the fading common in Chicago, it’s hard to tell. But there’s not just two marked lanes! There’s a THIRD lane that represents a bus bay, in front of the police station for westbound 77-Belmont buses. Westbound, the second through lane goes unused because much of the traffic in the curbside lane turns right onto northbound Western. But there’s little point in saying what the current geometry is because that’s all going out in the window for a new geometry. What matters is the current use and the desired future use. Currently there is little traffic on Belmont, even less on Clybourn, and little turning N-S traffic on Western (most of it is to turn left onto some direction of Belmont.) There are people biking but no bike lanes. Future? Well, we – and the city administration – want more people to bike and walk. This intersection makes that even harder because of the continued exclusion of bikeways and the lengthening of crossings. 1. Cut off Clybourn so it does not intersect at Belmont / Western. 2. Make Belmont & Western look the same as Roscoe & Western or Addison & Western, the 2 traffic lights to the North. Those east/west routes are very similar to Belmont. Why reinvent the wheel? Perhaps: Acquire the 3 properties (1 empty lot, 1 old auto shop/gas station?, 1 very old 4 story apartment) to extend Fletcher East of Western and connect it as the terminus of Clybourn (No left turns at Fletcher & Western, Southbound Western traffic wishing to turn onto Clybourn should continue and be routed through Diversey). I never once in my life have ridden my bike through that intersection. And I will continue to avoid that. Having said that, I think the bridge lane reconfiguration will be a big improvement. Coming from the Lakeview/Uptown, this will create the first continuous safe bike route to Logan Square: Roscoe to Campbell to Belmont. All big intersections are protected with lights and the entire route has (buffered) bike lanes. I don’t have a degree in engineering or design, but things like this make me think I’m about as qualified to design a city than the dopes who do. Randomly adding and subtracting lanes does more to slow traffic than almost anything else a design engineer can do, as everybody in cars winds up fighting to get back in line and slowing the whole mess down. By adding a bunch of temporary car lanes, they’re going to create the city’s next massive bottleneck. In 20 years, somebody will come up with a big and expensive Clybourn bypass to fix it. There may be businesses between Diversey and Belmont to scream bloody murder … I suppose you could do an Argyle-style paved-with-bricks-and-benches-with-trees setup from Barry to Belmont to make it clear that “through traffic” is not welcome, but still allow car-access to the buildings on that stretch? Or leave the street there and put in a cul-de-sac or a forced right onto Belmont, like they’re going to do with the section of Elston just south of Fullerton with the reroute project. Just do something so that it’s a 4-way instead of 5-way intersection so CDOT doesn’t think they need all these lanes in the intersection. This plan has been in the works for years, hasn’t it? Is this CDOT being stupid and not redoing the engineering on it for current complete streets policies instead of those from the Daley era? Agreed. Sometimes I think CDOT wants to make it miserable & dangerous for everyone to get around Chicago whether via car, bike, bus, foot or train. This design is a mess! Very disappointing. OMG CDOT! This area will remain a dead un-bikeable, un-walkable accident prone zone. I recently drove to a venue near this intersection. Parked on Belmont. Watched a few cyclists try to survive/safely get through the intersection. Remarked that I thought driving through there was scary enough & would NEVER bike through there. Waited for numerous minutes for the lights to allow me to cross the multiple intersections on foot to get to the venue. The street crossings were scary as the intersection is designed so cars blindly turn into the walk lane–when we had the walk sign. Not to mention infuriating that it took what felt like forever to cross 2 streets on foot! AND this is why I never want hear “sorry, we just don’t have enough money for proper bike infrastructure.” If the city can buy buildings, destroy buildings, add more road & pavement”—it is pretty clear we taxpayers have the money. Just not the right people in charge of the money. See, this is a reasonable position. If CDOT would have articulated that–and the bike route plan were consistent with that–that would have been a genuine explanation of how this is ‘supposed to’ work. Not that that would justify how they fooked up the Belmont lane configuration, especially just west of Western, but at least it would explain a piece of it. I was thinking along similar lines, about using Roscoe. CDOT still intends to put buffered bike lanes on Belmont (which I don’t think fit, but conventional lanes may) all the way to Halsted. So they intend Belmont to be a major bike route (it’s not not really, because of the lack of lanes and all the buses – the 77 has good frequency). But there should be bike infrastructure on both Roscoe and Belmont. A lot of people live off of Belmont and there are a lot of businesses on Belmont! Removing Clybourn from the intersection would drastically help CDOT “operationalize” car traffic on Belmont and Western because it would give them an additional 30 seconds of signal time to distribute between them, or just alternate faster between the two streets. The benefit would also extend to people waiting to walk across the street by reducing their wait time. Even if citing Campbell/Roscoe as an alternate, that ignores the connection for bikes b/t Belmont and Clybourn. But the failure to even mention Campbell/Roscoe as the ‘alternate’ is really very telling. I don’t know. The complete streets policy itself is a resolution that the council presumably accepted in like 2007 or 2008. Chicago was apparently one of the first cities to adopt one. Since then, though, many cities and states (including Illinois) have made their policies law (or just skipped straight to the lawmaking). The policy may have been there, but reality is that it’s been followed a lot more since Rahm took over, but the other example that comes to mind is the Fullerton/LSD intersection. Similar case in that design was done a while ago, and CDOT didn’t consider reworking it to actually follow complete streets. New projects seem to be better, but old ones like this end up being garbage. Actually, the Western/Diversey/Elston and Western/Addison intersections are slated for upgrades as part of this project. I haven’t seen any further details, though. Might just be a pavement overlay and landscaped medians. Still, that Elston intersection is a sububran hellhole so those medians may help a lot. The recently announced 312 RiverRun trail will be a nice north-south route, but CTA resistance helps explain why this area lacks east-west bike lanes.